Another year, another round of climate talks. 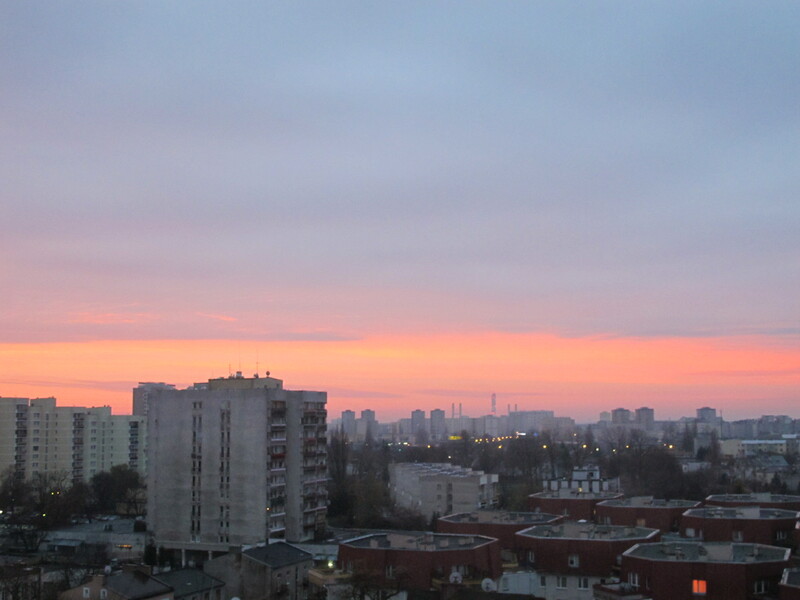 It’s the 19th Conference of Parties to the UN Climate Convention and we’re back in Poland, the scene of an almost complete non-event in 2008, the year before Copenhagen. It’s Eastern Europe’s turn to host another meeting, and nobody else was prepared to put their hand up, so we’re back in the land of coal, in the country that has rallied their biggest coal companies to sponsor the conference, and which is dragging the whole of the EU down to their level as they refuse to accept stronger targets. I suspect #coaland will be a well-used hashtag by the end of this. Usually when you come to a meeting like this, the town is full of banners and signs that a climate meeting is being hosted, but there’s not much sign of it here in Warsaw, except this rather confusing industry advertisement at the airport. Next weekend there’s a World Coal Association conference in town, being addressed by UNFCCC Executive Secretary Christian Figueres, who turned down a talk to youth at the Powershift conference in favour of talking with Big Coal. She’s assured them it’s because she wants to “talk frankly” – let’s hope she does. Last month the Polish hosts were caught posting a news piece heralding the melting of the Arctic as a new opportunity to explore for yet more fossil fuels. While The YesMen (in a specacular own-goal, in my opinion) tried to claim the piece as their own, it was indeed the Polish Government’s own work. Given this government is chairing the talks, it’s not looking terribly hopeful. Meanwhile in the Philippines, Cyclone Haiyan, the strongest tropical cyclone ever recorded, has caused a terrible loss of life that’s still being counted – and major damage. With winds at 195mph as it made landfall, it beat the 1969 record, according to Jeff Masters’ blog. Sea surface temperatures were up to 1.5degC above normal. There’s been much ado about climate sensitivity — the amount of warming we expect for a doubling of CO2 in the atmosphere — in the last month or two. A couple of recent papers, and an expected slight adjustment to the likely range in the upcoming IPCC fifth report1, has led to speculation that we might have less to worry about, or more time to get emissions cuts in place. It would be great if it were true, but it isn’t. In this excellent short video, Andrew Dessler, professor of atmospheric sciences at Texas A&M university, explains why atmospheric physics means it’s very unlikely that the climate sensitivity can be below 2ºC. For lots of other reasons why the most likely value remains about 3ºC, see this Skeptical Science post. Where we are, where we should be and the consequences. 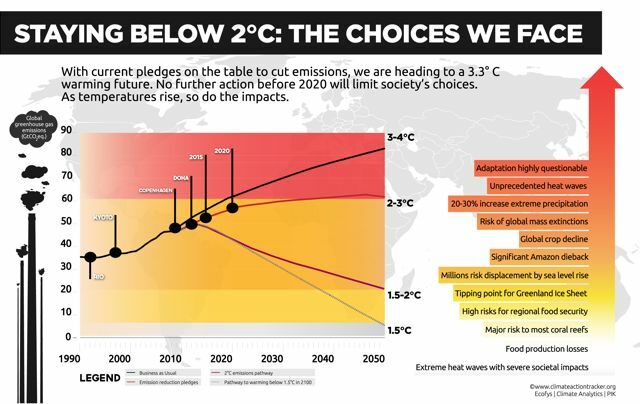 Climate Action Tracker’s graphic on our future choices. And so. Another set of climate talks done, this year dusted with Doha sand and labeled the “Doha Gateway”. I’m not sure what they’re a gateway to, certainly no immediate improvement to the climate. The final hours were bizarre, to say the least. We began the day on Saturday with a text much improved from the day before, but with some major issues outstanding. Ministers wrangled behind closed doors for most of the day, changing bits of text here and there. We were preparing for Russia who, with Kazakhstan, Belarus and the Ukraine, were set to continue the talks way into Saturday night. They were holding out in the informals, furious about the discussions on hot air. The “Russian factor” is one those of us who’ve been involved for a few years are all too familiar with. Just when you think there’s general agreement, in come the Russians who manage to drag the talks on for hours. “Hot air” has been major problem with the Kyoto Protocol for years. Somehow, the Russians managed to get the Kyoto negotiators to agree to a baseline of 1990, before the collapse of the former Soviet Union, which meant millions of tonnes of carbon credits ended up in the hands of Eastern European countries, bringing them a handy income, and other countries an easy and cheap option to do nothing at home and buy cheap hot air. Russia has 6Gt of hot air – that’s how much it’s been cheating the atmosphere. In Durban and Doha, New Zealand has sided with this team against the wish of the rest of the world to make sure that this “hot air” didn’t get carried over into Kyoto’s second commitment period (CP2).